John graduated from the Massachusetts College of Art in Boston in 1988 with a BFA in Painting. He currently lives in Oakland, California with his lovely wife Mary. 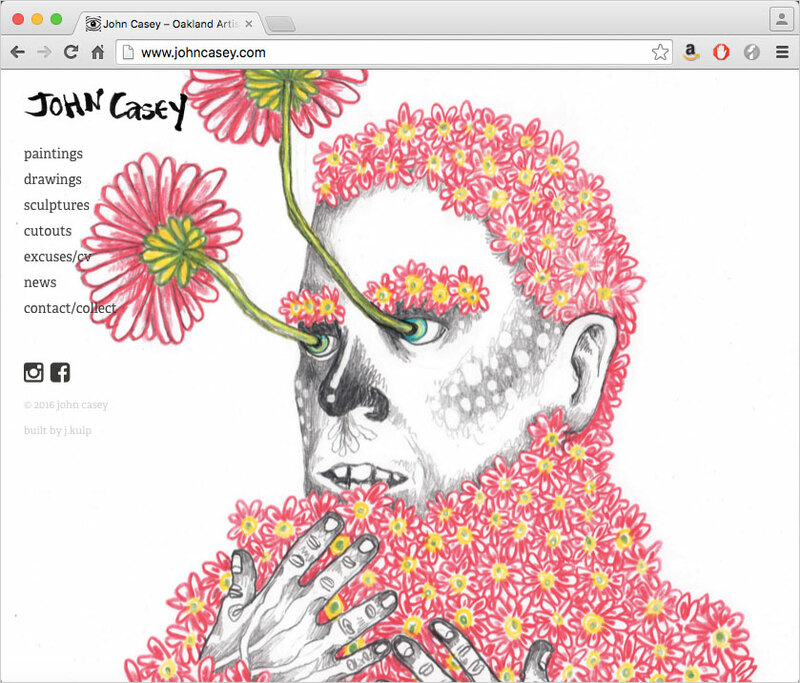 You can view John’s art at bunnywax.com. I maintain this blog because I am lucky enough to live in a very art-rich region. Blogging offers me the opportunity to share just a small portion of this art treasure trove I experience, with friends and readers near and far. San Francisco has a long, established art history with many galleries and top-notch museums. I attend many an event in SF. The city of Oakland, across the bay and our home for the last 12 years, has experienced a recent surge of creativity in the form of dozens of start-up artist-run galleries. Actually Oakland’s Art Murmur has been cranking away since the beginning of 2006 so “start-up” is probably not the correct description at this point. Although I periodically cover art and projects I am working on, my goal with this blog is to present some of my experience as an artist living and working, viewing and making art in the Bay Area. You may also see part my personal life revealed in vacation pics [thanks for putting up with that]. I hope you find this blog as informative as I find it cathartic. hey john – fun seeing you last night. i’m becoming a subscriber here. hope it works. it was hard to figure out how. but if i leave a comment and check the little box below – should work. Let’s hope it works. A post from last night will appear later today. Hi John, I just found your blog. Very nice! and your artwork is great. Thanks Heidi. I appreciate that. I will check out your blog too. Thanks! just stumbled onto your blog. I am glad to find people out there sharing what they come across in the “art world.” It helps keep somewhat of a perspective on things (seeing work from other areas) when contemporary art can feel so vast. Thanks JD. I do what I can. There’s so much art here in the Bay Area I see only a percentage of it. But I’m happy to share what I can. I was lucky enough to visit the USA and San Francisco last year- such a creative place, love your work. Sue from Oz. Thank you Sue! Oz is high on my “to visit” list. Do you mind sharing photos you took of Vessel with us? I really enjoy your work and documentation of process. It’s interesting to see the relationship between ideation and execution. Thanks for making such good (and big) work! I’m a fan! As a fellow artist, I really admire your work and your way of thinking! Great stuff!